When Hawkeye was killed off in Avengers Disassembled I was pretty peeved. Despite the fact that comic deaths last as long as the average teenage tantrum I was pretty adamant I wasn't picking up New Avengers as a result, and would teach Marvel a lesson by withholding my $3.50. Then the preview art showed Spider-Woman was part of the new membership, I decided Marvel had been in the naughty corner long enough, and was now aloud out. To find the 14th issue dedicated to continuity fixing the life of Jessica Drew and rendered by a 'cheesecake artist' like Frank Cho, well it was like our little spat had never existed at all. Gosh is she gorgeous. And I've always always always loved that costume. It's just one of the classics. It enters the category of "don't screw with this one." Even the name "Jessica Drew" just screams literary perfection. They never did enough with her. I'm so with you Dan, that bringing her back was brilliant, and one of the reasons to start reading Avengers again. 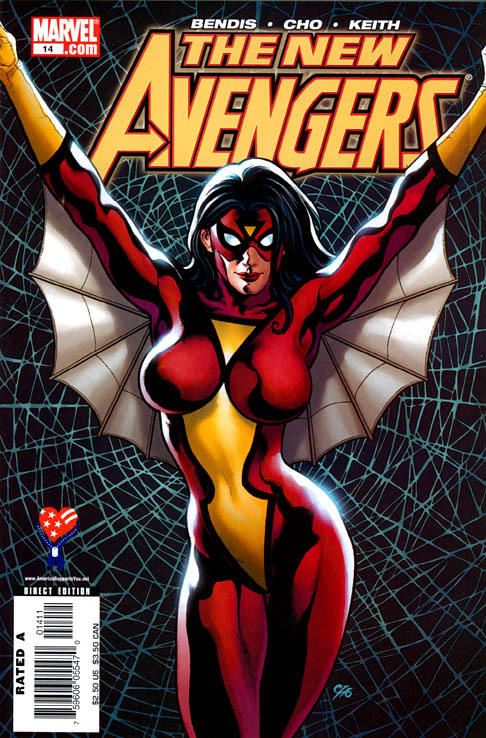 If for no other reason than to just gaze at Spiderwoman. And I'm a chick. I don't usually just sit and gaze at other chicks. But I love Spiderwoman. She rocks. Yeah Random - deffinitly a comic twin thing going down here. Spi is one of my favourites too and I agree the costume is holy and off limits to even Jim Lee. or Alex Ross. While the online comic idea doomed her solo series hopefully they start it up again in the not to distant future. She even had her own cartoon for Pete's sake! both that splash page and cover are pretty sweet! i remember thumbing through this Avengers issue some years back where Spiderwoman comes out in costume to greet some fellow Avengers and Luke Cage was like "I don't mean to come off as being sexist but like, damn!" She's one of the few you can say that about and NOT come off as a sexist about. Black Canary is another.